On 3/19/17 the Guadalupe County Sheriff’s Office received a theft complaint from a business in the 1600 block of Blue Creek near the New Berlin area. In this case, it appears two unknown subjects entered the business and stole a Hobart Champion Elite Welder/Generator from the bed of a pickup truck. This incident was documented via still shot images from a motion activated camera when the suspects entered and left the property. The truck is a light brown or tan 88-98 Chevrolet ¾ ton Regular cab, long bed truck with Farm plates, but the numbers on the plate are not visible. 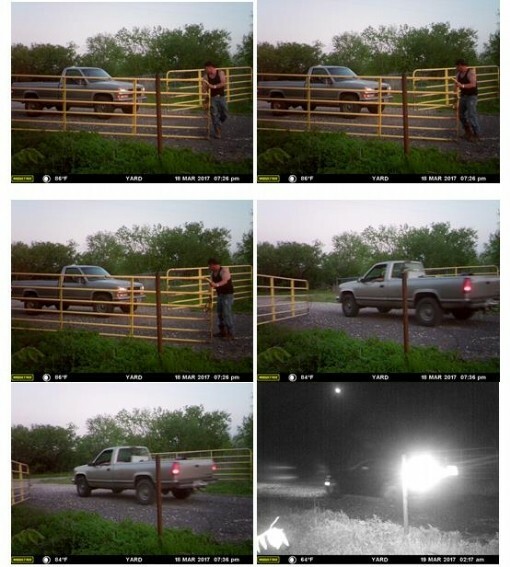 A white male subject is seen opening the gate and appears to be wearing a black muscle shirt, blue jeans, and boots. Later that night it appears a Black 99-04 Mustang also enters and leaves the property as well. Because it was at night, there is little identifying information for the second vehicle. The suspects and the operator of both vehicles remain unidentified. Anonymous tips can be call Guadalupe County Crime Stoppers at 877-403- TIPS (8477), online at www.gccsTIPS.com or P3 Tips App.